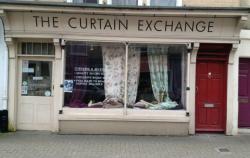 The Curtain Exchange in Bath has an eclectic mix of colour, texture and design offering a visual feast and superb choice. The curtains on display range from sleek/suede contemporary panels in taupes, greys and creams to ornate tapestries and brocades. Sumptuous silks are a speciality so there is something for everyone. The beautiful Georgian city of Bath is home to some spectacular architecture and we are fortunate to have been asked to dress some of the most stunning windows in the country. Our team will advise, measure and design for you if necessary and our made-to-measure service offers a range of gorgeous hand-sewn curtains and soft furnishings. Please don’t hesitate to contact either Sally or Melanie for advice or directions to the shop.